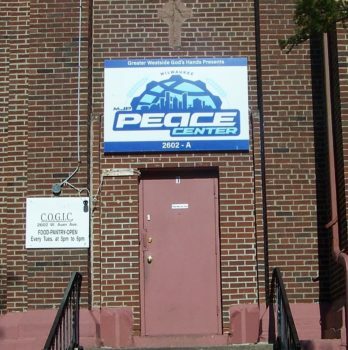 In following our company Purpose of Making a Difference in Our Communities, we worked with Honey Creek Church and the Michael J Prescott (MJP) Peace Center to repurpose a sign for their new center. After a Milwaukee pastor’s son was murdered in 2015, she opened a center in his name to keep kids safe. The MJP Peace Center is dedicated to the memory of a young man who promoted peace in the inner city of Milwaukee. Michael loved to play basketball and dreamed of opening his own gym. The basketball court on the second floor of the church was in total disrepair. Honey Creek Church partnered with the Peace Center to renovate the basketball court. Honey Creek brought in volunteers and companies who donated time, materials and services. We were asked to participate and were happy to be able to provide a sign for the building that proudly announces the center to the neighborhood. To help support the sustainability of the Center and the good work they are doing in the community, we selected the MJP Peace Center to be our 2017 holiday recipient. We donated funds through their GoFundMe page to further their good work of Making a Difference in their community. If the story moves you, please join us in supporting them.